How Indian Highways are Numbered (New NH Numbering System)? (Just in case you are not aware of) the Ministry of Road Transport & Highways had taken the initiative of re-numbering most of the highways in India a couple of years ago. It was a minor news item in most dailies then but I thought it’s a huge step towards rationalizing our road network names along with rebuilding the infrastructure. The National road grid in India has been getting a good boost ever since our former Prime Minister Shri. Atal Behari Vajpayee’s National highway development project (NHD) started materializing in stages. The North-South Corridor stretches from Srinagar in J&K state to Kanyakumari – the southernmost tip of India. The length of this major road is 4000kms. The Golden Quadrilateral (GQ) is the highway network connecting the four metros in India – i.e. Delhi, Mumbai, Chennai and Kolkata. The spin-offs of GQ also connects cities like Bangalore, Pune and Ahmedabad. The total length of GQ is 5846kms. Most part of the above highways is 4-lanes while 6-laning project is being undertaken in many stretches. If you refer to Google map for driving, you must have noticed symbols like AH, NH and SH. The following are the explanations for these respective codes. 1. National Highways (NH): These are major highways in India that provide connectivity to all cities and states. NHs are maintained by the Government of India (i.e. NHAI). As I mentioned earlier, National highways spans over 70,000 kms and even the NS-EW corridor and GQ are formed by many such highways. 2. State Highways (SH): State highways spans over 150,000kms in length and are managed by the state governments to provide accessibility and city/town inter-connectivity within each state. 3. Great Asian Highways (AH): Asian Highways are part of the cooperative project within Asian countries. While in principle, the National Highways in India themselves forms the AH stretch in India, it’s good to understand them from the map’s point of view. You will encounter many places in a map where the highway is referred to as an Asian Highway or AH. In reality though, there’s no separate road network for AHs but they consume the respective major highways in the participating countries to form the Asian Highway grid. You can read more about Asian Highways at Wikipedia. How the New Highway Numbering in India Works? Let us come to our main topic now. Until recently, the Indian highways were numbered in a very confusing manner that didn’t provide any logic behind their numbers. However, the Government of India took a major decision in 2010 to rationalize the highway numbers in a way that the number provides some clue about the geographic location and the direction of a particular highway. Please refer to this circular by DORTH to know all the renumbering that took place. I am not sure when the numbering process will be complete but I sincerely hope that they introduce a lot of sign boards to avert any confusion. Also, like in the US and some western countries, it may help if they provide some clue about which direction one is heading at any given moment. For example, 35W means a west bound highway. In India, since the major number (e.g. 35) corresponds to the direction itself, what the road signs or milestones should carry is something like 35-W or 35-E, I think. Wikipedia has a nice picture showing all the re-numbered highways. Please refer to this image link. 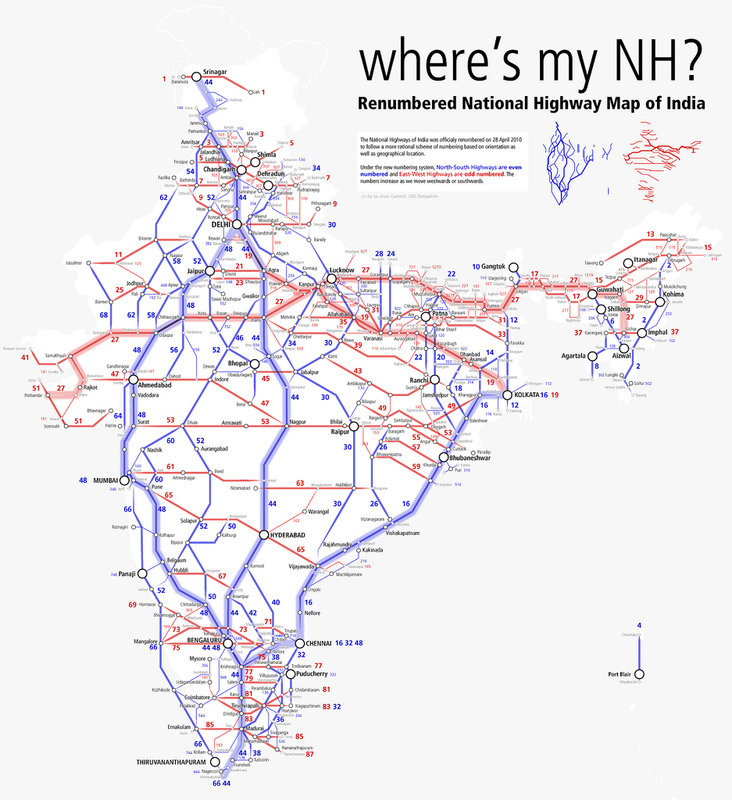 For a magnified view of the National highway map in India, please refer to this link. ‘Highways for Life’ is indeed the punch line for India as well. Yes, Vijay but we should be happy that such a huge country is already reasonably well connected. Thanks sir for the valuable information regarding the Indian Roadways system.. Thanks for the info. But I am confused about NH-5.If your first point is correct i.e all N-5 highways should be numbered as even ones,then how it’s numbered as 5(odd number) ? For your info NH-5 runs from kolkata to Chennai which I believe should come under N-S category. The method in giving new nos is not scientific. It should have started no 1 from Golden quadrilateral, west to east corridor, north to south corridor. Sir, I too agree with you. There is no indication that the NHs are numbered from 1. If so, definitely the previous NH7 (the longest Highway in the country) cannot be 44 now. If NHAI schedules to re-number again, it would be very sensible to number with a priority to the lengthiest Highway. Is there any change for nh13 solapur chitrdurga and 211 solapur dulhe? NH13 is now NH169 as per web information. NH211 remains the same I think. Kaushal, even I have traveled on NH4 many times. This highway number hasn’t changed yet, but it will soon when the new numbering system is into effect on all highways. It should ideally get a bigger two digit number. This is very similar to the Interstate numbering system in US. When are the new numbers commissioned? The old and new numbers are really confusing now. Is NH number and AH number different? Thanks for the information it was very useful. Very useful info..clearly mentioned points..thank you so much!!! Whenever one sees or walks or motors on a India’ national highways,one tends to lower his.her head before Bajpayee, Indian ex Prime Minister.Minister. Bajpayee was a great thinker and for his great thinking, the present day india’ highways have taken to days’ shape. svg file for indian highway numbering system. ANY BODY HELP ME THAT BALLIA NOIDA HIGHWAY IN PROCESSING ? Thank you sir for this important information. sir ,nh7 is S-N highway.from varanasi to kannyakumari..
.but it is a odd no..?? It’s the old number. It’s proposed to change to NH44, the official process is not completed. What’s the meaning of fraction numbering we often come across in road s in milestones and that too why some numbers are written 2/4 instead of 1/2… Has is it anyway got anything to do with the distances between intermediate locations?? I really enjoy this page and wonderfull use for unknown road service peoples and i am expect more details. Great information bringing about a semblence of order.. NH47 the road from Kkumari to Salem is named odd .. Is in’t it odd ? NH 47 is the old number. It’s being renamed to NH 544. Congrats. This is a wonderful job done after taking lot of efforts. Thanks & best wishes to you. Can we have more clear map. Present one on zoom becomes blur. Even though i have downloaded the high resolution map. NH7 is south to north I. e. from kanyakumari to Varanasi. It’s odd. As per your info it should be even. Don’t jump into conclusion without reading the post fully. NH7 is being renamed to NH44 for your information. Google map is following the new Indian Highway numbering system as mentioned this post. Did you notice any discrepancy in Maps app? Extremely usefull info now after seeing this i got a clear picture of Indian road network and its numbering system. Thanks a lot to ajith sir. Very useful information while self driving. For G.K. also good information. THis is superb piece of information. You made it achievable sir. Next PostNext How to Build a Simple Motor?